In our precision bellows manufacturing site, located in Poland, as a first step we make deep-drawn precision tubes. Mera Bellows is specialized in the production of very thin-walled tubing with closed ends that is then hydroformed into the typical corrugated shape. Our smallest bellows start at 4.2mm ID and less than 0.1mm of wall-thickness if needed. For designing considerations, the application is of paramount importance. Is the bellows e.g. used as coupling for rotating shafts, as metallic sealing or pressure sensor? The prior aspects have to be considered by the manufacturer to finally supply a suitable and sustainable component. As part of our zero-failure philosophy, every production process is monitored and statistically analyzed. Mera Bellows applies a 100% final control, visually and for leakage. Spring rate testing, cycle testing and other measurements on demand. Different materials are suitable for the production of our precision tubes, including different kinds of stainless steel, brass and alloys of nickel-copper (Monel400) or beryllium-copper. Offering seamless constructions, we can achieve small tolerances in diameter and wall thickness. That helps us to guarantee a stable performance for all our precision bellows. 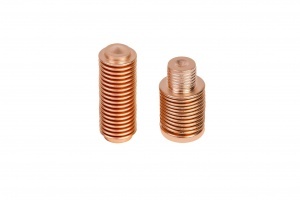 Based on their small spring rates, precision bellows made of non-ferrous metals (especially tombac and bronze) are especially suitable for measuring, controlling and regulating applications. Often in bottom design (one closed end) they are used to convert pressure into movement. In thermostatic heads, for instance, our closed-ended bronze bellows are used millionfold for heating systems all around the world. The thermostat bellows behave like a spring. They are filled with alcohol and actuate the mechanical system. If the temperature rises, the precision bellows expands in an axial direction. The thermostatic valve flow is reduced for an exact temperature regulation. If room temperature decreases, the bellows shortens – and consequently, the regulator valve opens and heating capacity increases again. Our stainless steel precision tubes are requested to withstand extreme environments and high working pressures. They can be implemented for the distribution of very hot liquids. 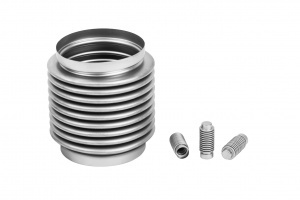 The corrugated precision metal bellows, manufactured in one of our standard stainless steels are often implemented as flexible maintenance-free hermetic sealing of a valve stem. Other projects require high electric conductivity or extra flexible constructions. For all purposes, we manufacture products that meet your exact specifications.